There’s a great offer today at Betsafe Casino where you can get up to 100 free spins on the Christmas Edition of the popular NetEnt slot, Flowers. If you qualify for this promotion, you will also be entered automatically into tomorrow’s prize draw to win a Sony Bravia Smart 48 inch LED TV. 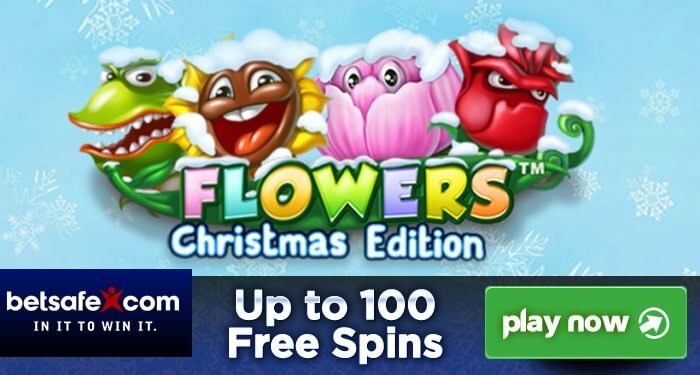 Powered by Net Entertainment, Flowers Christmas Edition is a festively-themed version of the extremely popular Flowers slot. With 5 reels and 30 paylines, you can play away from just 30p a spin. Available on desktop, mobile and tablet devices, these weird flowers can give you double symbols, wild substitutions and a free spins feature with stacked wilds. You have the Free Spins feature where you can get up to 30 free spins initially as well as a 10 times stake cash prize. All free spins are subject to a 3x multiplier but what makes this feature potentially lucrative are the stacked wilds. However, you can benefit from Double symbols on the 3 middle reels in both the feature in base game which can lead to 10 symbol winning combinations. There’s a blooming 500 times stake win available in Flowers too. For more details and to play for free, read the Flowers slot review. Betsafe Casino has over 300 slot games to choose from – you have titles from ELK Studios, Bally Technologies, Play ‘N Go, WMS Gaming, Microgaming, NextGen Gaming, Leander Games, Quickspin and Barcrest amongst others. If you want to play recently released slots, you have Taco Brothers from ELK Studio, Koi Princess from NetEnt, Rage to Riches from Play ‘N Go and Zeus 1000 from WMS. Haven’t got an account? You will receive a 100% first deposit bonus up to £200 plus 50 free spins on Gonzo’s Quest.